The massive Monarch Butterfly migration has become -- and it comes at a time when the species faces a huge threat. It’s an amazing phenomenon unlike anything else in the world: the massive migration of Monarch Butterflies from Canada and the Northern United States to destinations south — but it comes at a perilous time for this colorful creature. Monarchs are taking flight for the annual migration to the Sierra Madre Mountains in Mexico — for eastern Monarchs — and for western Monarchs the destination is California. They spend their winter roosting in the trees high above the ground, sometimes up to 3,600 meters above sea levels. These Monarchs cluster together to stay warm and survive the winter before heading back to their breeding grounds. But according to the U.S. Fish & Wildlife Service, the species is more threatened than it ever has been. Counts of the orange-and-black butterflies are dropping significantly, and this amazing migration is currently threatened. How can you help? For one thing, you can sow milkweed seed, which these butterflies need to grow. Milkweed pods can be picked in the early fall, and it is the host plant of the Monarchs. It is only on these plants that the Monarch Butterfly will lay its eggs in the spring, and it’s the only food source for Monarch larvae. 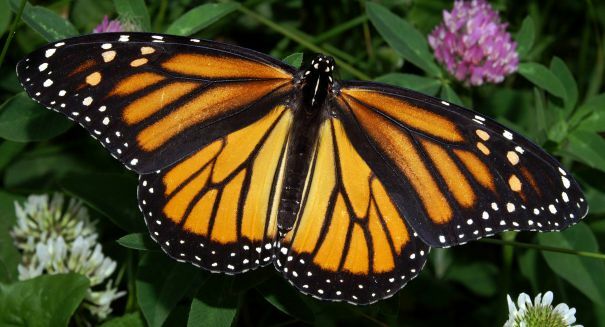 The reason why Monarchs are so threatened is because milkweed has been disappearing, mostly because of farming with crops that are genetically modified to resist herbicides, which kill plants like milkweed that often grow in farm fields. The milkweed doesn’t have this genetic protection. Then there’s urban sprawl and development, which has taken away a lot of the habitat that Monarchs had depended upon. Fortunately, it doesn’t take a lot of milkweed plants to help Monarchs out, so every little bit helps. If you want to help out the species, that’s one step you can take. Many groups have been formed to look for milkweed each fall and collect seeds for sowing. However, be careful with milkweed, as its sap can cause injury to your eyes, so handle it with gloves.